SAAB AUTOMOBILE AB has scrapped its planned merger with Hawtai Motor of China a week after it was announced, throwing the Swedish carmaker’s future into fresh doubt. Hawtai appeared to have rescued Saab from the brink of collapse last week when it agreed to pump €150 million into the troubled company. But the deal was met with scepticism in China and Sweden amid doubts over Hawtai’s ability to fulfil the agreement. Spyker Cars, the small Dutch firm that bought Saab from GM last year, announced yesterday the deal had been cancelled. “Since it became clear that Hawtai was not able to obtain all the necessary consents, the parties were forced to terminate the agreement,” said Spyker. The Dutch company said it would continue talks with Hawtai but on a non-exclusive basis. There has been no production at Saab’s main factory in Sweden for the past month after some suppliers stopped deliveries over unpaid bills. Spyker said production would resume once fresh financing had been secured. In addition to its Chinese talks, Spyker is in negotiations with the European Investment Bank, its biggest creditor, and the Swedish government over a proposed investment by Vladimir Antonov, the Russian financier. Analysts were sceptical about the Saab-Hawtai tie-up because Hawtai, based in Shandong province, is a small and recent entrant into the fragmented Chinese car industry. The Chinese government is keen to encourage consolidation and has focused support on a handful of bigger, mostly state-owned carmakers. This raised doubts over whether Hawtai would receive Beijing’s blessing for its plan to buy a 29.9 per cent stake in Saab. Beijing’s key planning agency, the NDRC which must approve such deals, may have been sceptical Hawtai had the ability to manage a loss-making foreign brand, analysts said. Saab Automobile AB has scrapped its planned alliance with Hawtai Motor of China a week after it was announced, throwing the Swedish carmaker’s future into fresh doubt. Hawtai appeared to have rescued Saab from the brink of collapse last week when it agreed to pump €150m ($211.9m) into the troubled company. But the deal was met with scepticism in China and Sweden amid doubts over Hawtai’s ability to fulfil the agreement. Spyker Cars, the small Dutch company which bought Saab from General Motors last year, announced on Thursday that the deal had been cancelled. The Dutch company said it would continue talks with Hawtai but on a non-exclusive basis, allowing it to enter negotiations with other potential Chinese partners. Production has been halted at Saab’s main production facility in Sweden for the past month after some suppliers stopped deliveries in protest over unpaid bills. Spyker said on Thursday that production would resume once fresh financing had been secured, cancelling previously announced plans to resume output this week. This raised doubts over whether Hawtai would receive Beijing’s blessing for its plan to buy a 29.9 per cent stake in Saab. Bill Russo, head of Synergistics auto consultancy in Beijing and former head of Chrysler in China, says deals in China “are never firm until you have all the approvals”. Beijing’s central planning agency, the National Development and Reform Commission (NDRC), which must approve such deals, may have been sceptical that Hawtai had the ability to manage a loss-making foreign brand, analysts said. Some Chinese carmakers have sought access to western technology through acquisitions and partnerships, including last year’s deal by Geely to buy Volvo Cars of Sweden from Ford. However, Tang Nan, Shanghai-based auto analyst with Tianxiang Investment, said it was becoming tougher for foreign companies to do such deals in China. “Chinese companies are not that eager to find global partners and foreign companies have to face this change, and be realistic if they want any deal with Chinese auto firms,” she said. Chinese regulators last year rejected a bid by GM to sell its loss-making Hummer brand to a little known heavy machinery company, Sichuan Tengzhong Heavy Industrial Machinery. In addition to its Chinese talks, Spyker is also in negotiations with the European Investment Bank, its biggest creditor, and the Swedish government over a proposed investment by Vladimir Antonov, the Russian financier. Analysts were sceptical about the Saab-Hawtai tie-up because Hawtai, based in Shandong province, is a relatively small and recent entrant into the highly fragmented Chinese car industry. The Chinese government is keen to encourage consolidation and has focused its support on a handful of bigger, mostly state-owned carmakers. April 22 (Bloomberg) -- Bill Russo, Beijing-based adviser at Booz & Co. and president of automotive consulting company Synergistics, talks about the outlook for China's car market and the Shanghai auto show. assenger-car sales slowed in April from the previous month as the government raised fuel prices and Japan’s record earthquake slowed deliveries. Deliveries of cars including multipurpose and sport-utility vehicles to dealerships rose 2.8 percent from a year earlier to 1.14 million units, the China Association of Automobile Manufacturers said in a statement today. Sales climbed 6.5 percent in March. Automakers including General Motors Co. (GM), BYD Co. and Toyota Motor Corp. posted lower sales as China increased retail gasoline and diesel prices twice this year and Japan’s 9- magnitude tremblor in March cut deliveries. China reinstated a 10 percent sales tax and removed trade-in subsidies, while the central bank raised lending rates four times since mid-October to tackle inflation. “People started to be hesitant about what was happening in terms of the slowdown measures from the central bank and how that will pan out in the economy,” said Ivo Naumann, Shanghai- based managing director at industry researcher AlixPartners. Total vehicle sales fell 0.25 percent in April to 1.55 million units as sales of commercial vehicles declined, according to the auto group. Commercial-vehicle deliveries dropped 7.8 percent from a year ago to 409,700 units, it said. China last raised retail fuel prices in April after oil advanced to a 30-month high. Auto sales growth in China this year may rise more slowly than the nation’s gross domestic product, Dong Yang, vice chairman of the auto group, said today in a briefing in Beijing. The government target is for 8 percent economic growth this year. GM China sales fell 5 percent in April as the company sold 203,367 vehicles last month, the Detroit-based company said May 5. BYD Co., the automaker backed by Warren Buffett, reported a 41 percent plunge in March sales. Honda Motor Co. and Nissan Motor Co.’s China joint ventures may produce 10,000 to 15,000 fewer units last month and output will likely worsen in May as a result of those component shortages, Hung Bin Toh, a Hong Kong-based analyst at Credit Suisse, wrote in an April 15 report, citing a conference call. Overall auto sales in China surged 32 percent last year to a record 18.1 million, surpassing the U.S. for the second year. China’s auto sales have doubled since 2008, and there’s plenty of growth still ahead. But that growth isn’t just about selling cars. From service to accessories, finance, insurance, rentals, crash repair, road construction…even prosthetic limbs (the result of inexperienced drivers involved in gruesome crashes), China’s new automobile culture is boosting sales all over the place. One obvious downstream industry that will ride the wave of increased auto sales is road construction. 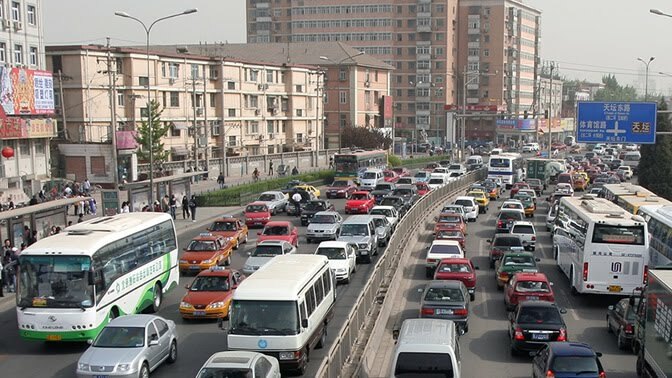 With nearly 400,000 miles of roads build from 2006-2010, China has clearly been on the fast track. And there’s no end in sight with goals set for road improvement, expressway construction and rural road construction. Car repair shops also are seeing dollar signs, thanks in part to young customer base of first-time, new car buyers. “Seventy-five percent of our customers are 35 and younger,” said Kirk Cordill, head of BMW Automotive Finance in China. The driving records of such inexperienced, undeveloped drivers result in high accident rates, which have paint and body shops raking in the bucks. The vanity side of the car boom has accessory shops cashing in, too. Headlamps, seat covers, the horn, the video system all get customized. Some car owners will even repaint a new car so that it’s a better reflection of who they are. “This is a culture that people from afar see as very uniform, but when you experience it firsthand you realize how unique and personal people like to be ... because they want to break away from the pack,” explains Russo. None of the Ivy Funds mentioned in this section hold Chrysler Group or BMW.